Upper Buntsandstein deposits (mainly Myophoria beds, Röt Formation, Early Anisian) in Lower Franconia and Thuringia have yielded a rather rich insect fauna comprising ca. 300 insect specimens assigned to ten orders: Archaeognatha (Dasyleptidae), Ephemeroptera, Blattodea, Grylloblattida, Orthoptera, Hemiptera, Glosselytrodea, Coleoptera, Mecoptera and Diptera. The systematic list of recorded insects is provided. Two species are identified as Triassodotes vogesiacus Sinitshenkova, Marchal-Papier, Grauvogel-Stamm et Gall, 2005 (Ephemeroptera: Misthodotidae) and Pseudopolycentropus triasicus Papier, Nel et Grauvogel-Stamm, 1996 (Mecoptera), which were previously described from the “Grès à Voltzia” Formation of the Vosges, the stratigraphically closest insect fauna. All grylloblattid specimens are identified as Chauliodites picteti Heer, 1864 (Chaulioditidae), known previously from the Middle Buntsandstein of Gödewitz, Saxony-Anhalt. The new genus and species Hammephemera pulchra Sinitshenkova, gen. et sp. n. (Ephemeroptera: Sharephemeridae) is described. Der Oberen Buntsandstein (hauptsächlich aus Myophorien-Schichten, Röt Formation, Unter-Anisium) in Unterfranken und Thüringen bringt ziemlich reiche Insektenfauna, in der ca. 300 Exemplare festgestellt wurden, die zu zehn Ordnungen gehören: Archaeognatha (Dasyleptidae), Ephemeroptera, Blattodea, Grylloblattida, Orthoptera, Hemiptera, Glosselytrodea, Coleoptera, Mecoptera und Diptera. Zwei Arten, Triassodotes vogesiacus Sinitshenkova, Marchal-Papier, Grauvogel-Stamm et Gall, 2005 (Ephemeroptera: Misthodotidae) und Pseudopolycentropus triasicus Papier, Nel et Grauvogel-Stamm, 1996 (Mecoptera) sind auch in der stratigraphisch nächsten Insektenfauna der “Grès à Voltzia” Formation der Vogesen verbreitet. Alle Grylloblattiden-Reste werden zu Chauliodites picteti Heer, 1864 (Chaulioditidae) gestellt. Neu aufgestellt werden eine neue Gattung und Art der Sharephemeridae (Ephemeroptera): Hammephemera pulchra Sinitshenkova, gen. et sp. 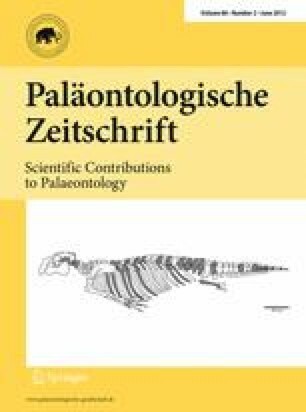 n.
We are deeply grateful to Dr. Dmitry Shcherbakov [Borissiak Palaeontological Institute, Russian Academy of Sciences (PIN)] who excited his interest in the problem, reviewed the manuscript and proposed some important revisions, and in addition redetermined Brauckmann and Schlüter’s types of Hemiptera; to Prof. Alexandr Rasnitsyn (PIN) for providing the determination of Dasyleptidae and Glosselytrodea, and for further helpful comments; to Prof. C. Brauckmann (Clausthal University of Technology), Dr. Jean-Claude Gall (Louis Pasteur University, Strasbourg) and Prof. Jörg Schneider (Freiberg University, Geological Institute) for the critical reading of the manuscript and valuable information; to Lea Grauvogel-Stamm (Louis Pasteur University, Strasbourg) for providing access to the insect collections of the Vosges. Finally, we wish to thank to Michael and Larissa Henz, Bernd Neubig (SMTE) and Elena Bashkueva for their comprehensive aid in the study. The research was supported by the Russian Foundation for Basic Research, project 09-04- 01241, and by the Program 15 of the Presidium of the Russian Academy of Sciences “The Origin of the Biosphere and Evolution of the Geo-Biosystems”.